There are many reasons why one might need a portable generator. With daylight dwindling each passing day, its time to start thinking about how you’re going to have to power to light up a construction site or use certain tools. With Hurricane Matthew and other weather conditions sweeping through the land, you may also need a generator for power outages within your own home. Don’t worry we have all been there. It’s not like you’re not going to see that hurricane or snowstorm coming. Bob the weatherman would have most likely been talking about for days and if its really serious you’ll get that annoying sound and banner that pops up on your television or phone. Renting portable generator is simple and only requires a short visit to your local hardware store or rental dealer. The most common portable generator to rent is small, on wheels, often around 10 horsepower, and powered by a small gas engine. However there’s more to it than that. 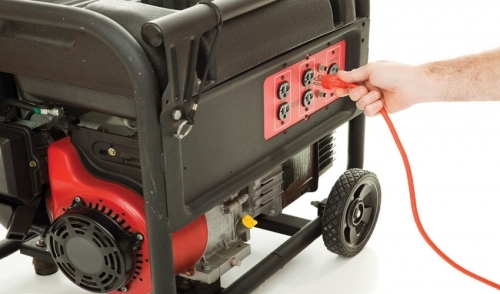 Follow this article for tips on renting a portable generator and practicing proper safety. Begin by compiling a list of appliances and the wattage they require to run. Talk to your rental provider or a professional about your needs so that you rent a generator that matches the required power needed for your home or project. If you are unsure about the wattage, grab a wattage worksheet online or from the hardware store to get an estimate of what you will need. The wattage will be listed on the generators’ nameplate for your convenience. If it’s not listed, but amperage is, just calculate the wattage by multiplying amps by volts. The best portable generator for you to rent will also be defined by how much interaction you want with the system itself and your budget. This means if you’re renting it to power a small construction site then you’ll need something with fair size and power. If you’re looking to rent one for emergency purposes to power your home when the lights go out, then you’ll most likely require something smaller. Keep in mind there are both electrical and gas options, but electric generators do require more safety precautions. They also require proper extension cords. Cords that are too long can affect the electrical load that its carrying and cause damage. On the flip side, gas generators are more flammable due to the use of gasoline; they produce carbon monoxide and can cause harm if used within an enclosed space. Most importantly, when you rent a portable generator make sure to use it in a dry space and that it’s grounded to avoid electrocution or damage risks. Plan ahead and read all instructions before operating a portable generator. Power is important, but not at the expense of your safety. Renting a portable generator is cost effective and easy to do. If you’re looking to save a couple of thousand dollars, complete a project or get your family through a rough patch, visit your local hardware store and rent a portable generator today.